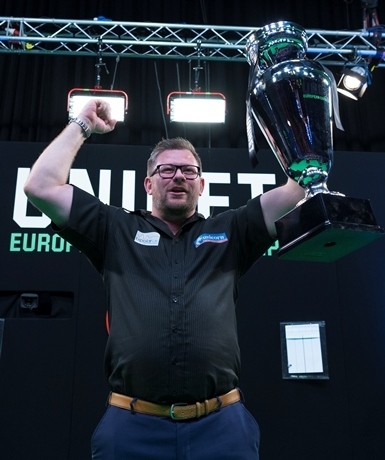 Team Unicorn’s James Wade has won the European Championship. On a dramatic day when he survived six match darts in the quarter and semi-finals, Wade stormed to an 11-8 win over Simon Whitlock in the final in Dortmund. It’s his first ‘Major’ TV ranking final in more than seven years, but an 8th ‘Major’ in all. It was a fabulous achievement and of course it is a double celebration after the birth of his son Arthur earlier this month! But there was heartache for fellow Unicorn ace Joe Cullen who threw away a 10-7 lead to lose the semi-final 11-10 to Whitlock. Wade though, is back up to No.6 in the world after claiming the £100,000 prize. He has also clinched a place at the Grand Slam and almost certainly a place in the 2018 Premier League. The European Championship triumph is also his first tournament win of any kind for two-and-a-half years. Amazingly Wade came from 8-9 down to survive three match darts and beat Gerwyn Price 10-9 in the quarter-finals. He then ended German hopes as he battled back brilliantly from 5-9 down to win another deciding leg in the semi-finals. Max Hopp looked in control and when he hit a 5th 180 when throwing for the match at 10-9, it looked all over. But Wade found a superb maximum of his own to put the pressure on and Hopp incredibly missed three match darts! Wade pinched the leg and then nailed a stunning 102 finish in the deciding leg. In the final, it came down to mental strength as well - and after Whitlock missed two darts for a 4-1 lead, Wade started to get a grip. It was nip and tuck and at 8-8, the title was there for the taking. A superb 171 helped Wade into a 9-8 lead then a beautifully timed maximum saw him claim the crucial break. A 5th 180 then helped him to wrap it all up. In fact he hit three 180s and that 171 in the last four legs.....just terrific! Wade found that all important extra gear when it really mattered. Cullen though was crestfallen, and you had to feel for him. The darting door was open with all sorts of opportunities on offer, but he lost the last four legs and only managed to give himself one match dart. A place in the final would have secured a spot at the Grand Slam and who knows what else. After coming back brilliantly from 1-6 down to beat World Champion Rob Cross in the quarter-finals, the stage was set for the Unicorn star. Neither player was anywhere near their best, so it was always going to be a scrap. Whitlock went 3-0 up but missed five darts to make it 4-0 and Cullen got himself back into the match. From seven legs apiece, Cullen found a purple match with three straight legs. He was one away from his first ever ‘Major’ TV final. But Whitlock produced back-to-back legs and then won the 20th leg with the last dart in hand when Cullen was sat on 36 to win it. Cullen had the darts in the decider but couldn’t find the big scores. However, he fashioned one chance at D9 but the dart sailed high and it was heartbreak as Whitlock held his nerve to nail 110 on D18 to pinch it in dramatic circumstances. But Dortmund 2018 is all about James Wade! Meanwhile the draw has been made for the World Series Finals in Vienna. Seven Team Unicorn stars will bid for glory in Austria at the weekend. Gary Anderson will face either Dave Chisnall or Dawson Murschell and Michael Smith has been drawn against the winner of an all Unicorn clash between Ian White and Kyle Anderson. Wade will take on Mensur Suljovic if he can get past Ross Smith in the 1st Round, while Dimitri van den Bergh will meet Rob Cross if he beats Jamie Lewis. Meanwhile Keegan Brown plays Australian Raymond Smith in round one. A victory would see him clash with Raymond van Barneveld in the last 16.